ProActive Cloud Automation (PCA) allows to automate service deployment, together with their life-cycle management. Services are instantiated by workflows (executed as a Job by the Scheduler), and related workflows allow to move instances from a state to another one. At any point in time, each Service Instance has a specific State (RUNNING, ERROR, FINISHED, etc.). Attached to each Service Instance, PCA service stores several information such as: Service Instance Id, Service Id, Service Instance State, the ordered list of Jobs executed for the Service, a set of variables with their values (a map that includes for instance the service endpoint), etc. A set of workflows representing Actions and having the same Service ID. An Activated Service is an Instance of a Service. It is characterized by a Service ID and an Instance ID. An Action will launch a workflow on a Service Instance modifying its State. An action is characterized by <a Service ID + a workflow ID + a state>. The Service ID and the State are respectively named « pca.service.id » and « pca.states » in the list of the workflow Generic Information. An Action goes from an initial State and conducts to a target State after the Transition is completed. As an Action must be deterministic, for an given initial State it can conduct to a unique target state. The specific States that are pre-defined in ProActive Cloud Automation are VOID, FINISHED, ERROR, KILLED. KILLED When PCA abnormally forces an Activated Service to terminate. Service_Name, Infrastructure_Name are Service specific. If a Service wants/needs them, they can be stored in the data associated to the service to give a name to the service, to identify the infrastructure where the Service Instance will be deployed. This paragraph describes how an Activated Service goes from one State to another. For instance how the Activated Service S1 transitions from the State RUNNING to the State SUSPENDED. meaning that the current workflow, for the current Service ID, when activated in State a, will transition the Service Instance in State b; or if activated in State c, the target state will be d.
An Activation Workflow (allowing to start a Service Instance) will have pca.states=(VOID,x). Actions that can be applied on Activated Services depend on their State. If they are in the State « CUR_STATE », all the workflow actions that have the Generic Information named « pca.states » equal to (CUR_STATE, xyz_state) or (ALL, xyz_state) can be executed. After executing the workflow actions, if everything goes right, the Activated Services will be in the state « xyz_state ». An Activated Service can be in a specific Transitioning State. In that case the State is labeled with the string "INITIAL_STATE -→ DESTINATION_STATE", for instance "RUNNING -→ FINISHED". No new Action can be started on a Transitioning Activated Service, except the Kill action. When a PCA Workflow deploys a Service, it keeps the Nodes needed to execute the service Busy (with a Sleep on one or several Tasks). One can use those Tasks to stream output (log) of the Service Instance such that it does appear in the Scheduler. We add to that stream all outputs of the Service Instance (e.g. getting all the logs from Swarm, HDFS, Spark at the same time in the Scheduler portal). The Nodes being used can be taken from an existing Node Source (e.g. ServiceNodeSource), or launched specifically at the beginning of the deployment (e.g. starting a NodeSource on Azure Cloud). Please note that the Service must contain at least two workflows: a start workflow which will create the Service Instance and a finish workflow which will delete the Service Instance. Moreover the start workflow must have a task which will reserve the nodes. One of the strategy is to create a task with a sleep that will loop until an action change the Service Instance State. There is no implicit detection of the end of a Transitioning State. A workflow that carries on a transition has to inform Cloud Automation Service that the transition is actually successfully finished. Each service workflows will contain a task that will update the Service Instance State after finishing its Actions. To execute an Action, PCA will submit a Workflow to the scheduler, using as Variable Map all the Variables that have been collected and updated so far for that Service. A first Task in the Wf is expected to collect all the values, even those not explicitly being Wf Variables. 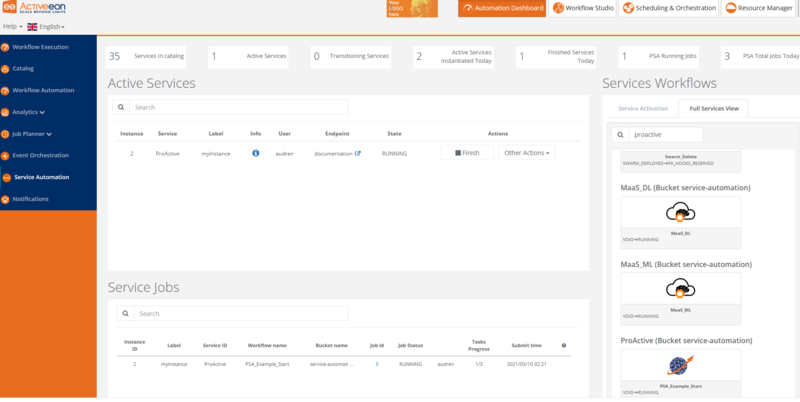 A Cloud Automation Workflow and third parties can get access to information about a Service Instance through Cloud Automation service. It allows for instance a Delete Action to get the URLs of the Nodes where the Service Instance is deployed, or the Docker Containers that are being used and need to be killed to terminate the Service Instance. E.g. A Cloud Automation workflow that starts Docker containers on the nodes is expected to store the Docker Ids in Cloud Automation Service for that Instance. 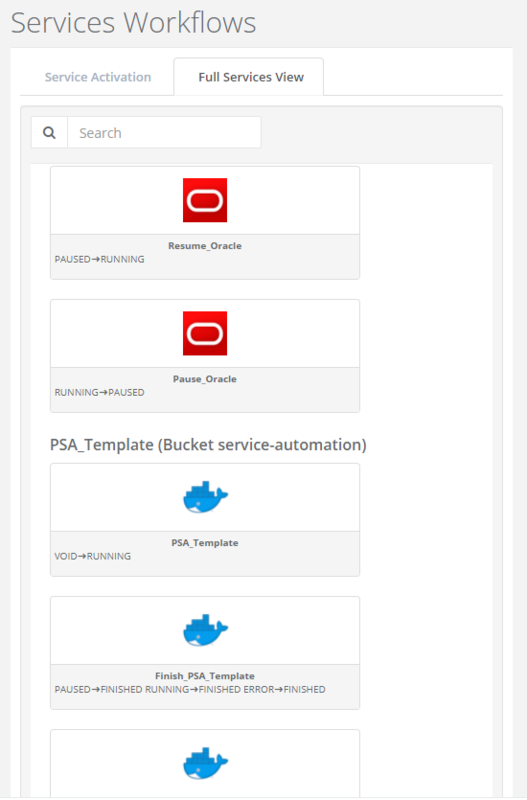 From the beginning of its Activation, when an Action is executed, the Variables/Values of the action Workflows are stored and append within the PCA service for that service instance. When a Variable already existed in the list, its value is updated with the last workflow value (AddAll). From the beginning of its Activation, until it reaches the FINISH state, a Service Instance has in PCA service (and accessible through the API) the ordered list of Job Id that has been executed as Action on it. Besides the Job ids, Cloud Automation service does not duplicate and store any information about the Job. The Cloud Automation portal will get those information from the Scheduler. The ProActive Cloud Automation (PCA) Portal allows to have access on several tabs. 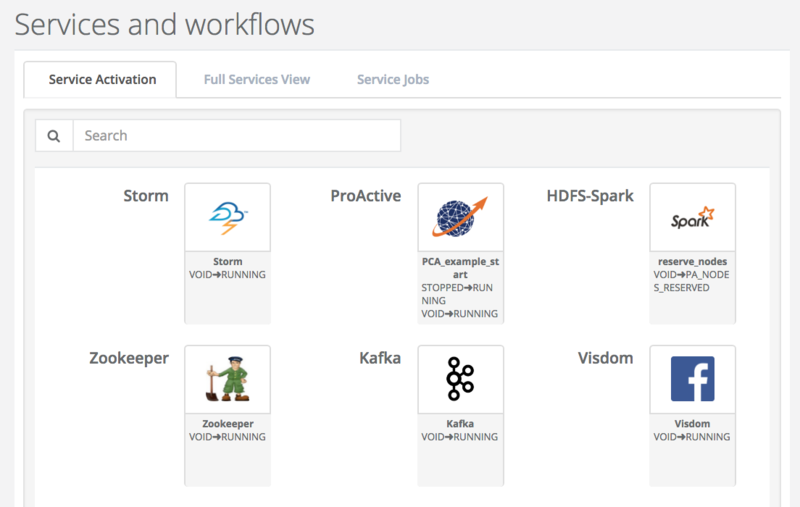 Full Services View gives all Cloud Automation workflows sorted by Service. Only creation workflows can be submitted from this tab to create Service Instances. 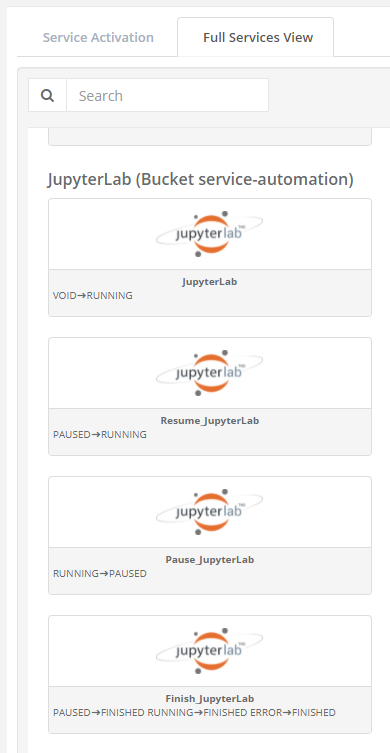 Service Jobs shows all jobs related to activated Service Instances grouped by Service Instances. Activated Services gives the list of Services that are not in State ‘FINISHED’ or ‘KILLED’. Finished Services shows the list of Services that are in State ‘FINISHED’ and ‘KILLED’. 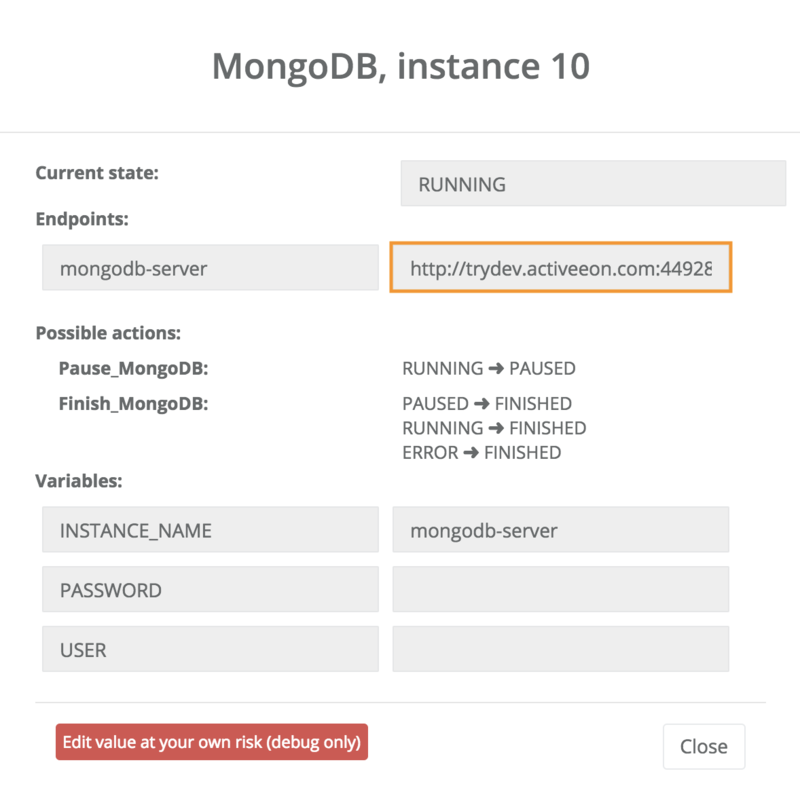 The CLEAN action removes the Service Instance from the database. In this section, we show how to start a PCA service and how to use actions that manage its life cycle. To do that, we choose MongoDB and Spark/Hdfs PCA services as running examples. To start the mongoDB service, you have to go to the cloud automation section in the automation dashboard portal and choose MongoDB service from the service activation tab. At this point, you can provide values for variables that help configure this service then press execute. Two actions are possible at this step; pause or finish the instance. The running instance can be paused by executing the pause action when the instance is in the RUNNING state. The pause action suspends only processes in the specified containers to release resources without losing data/container. From the pause state, two actions are possible; resume or finish the instance. 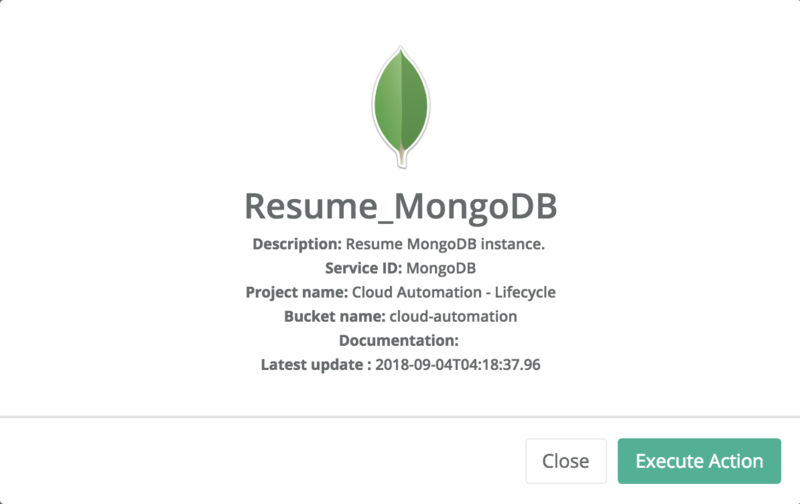 The resume action allows to restart a paused instance while preserving previous state of the database. The instance is the RUNNING state. When the user does not need this PCA service anymore, he can delete it to release resources using the finish action. This action can be applied when the instance is in the RUNNING or PAUSED state. 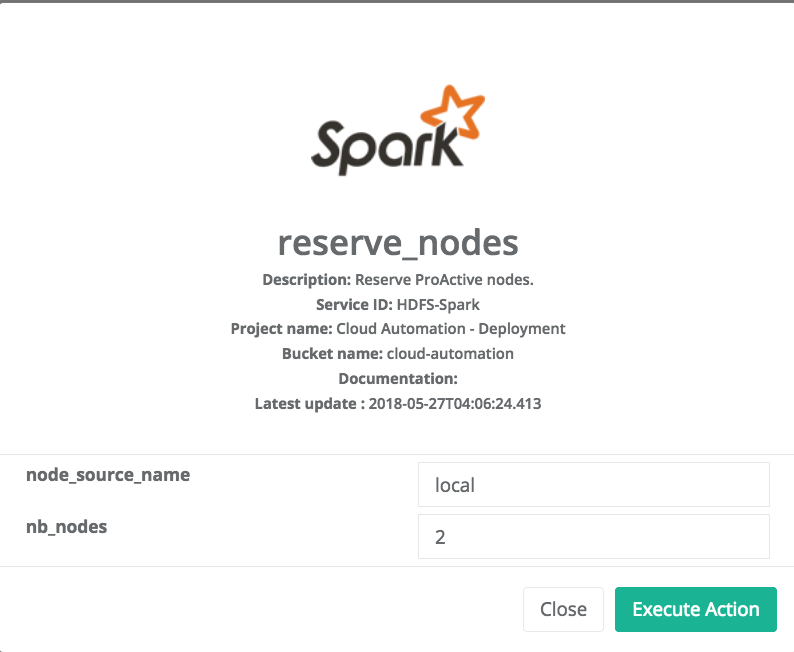 In this example, we show how to deploy through PCA Portal a HDFS and Spark platform that be used to run big data applications. This step allows to reserve the ressource to use to host the platform. After the node reservation, two actions are possible from the Actions tab. 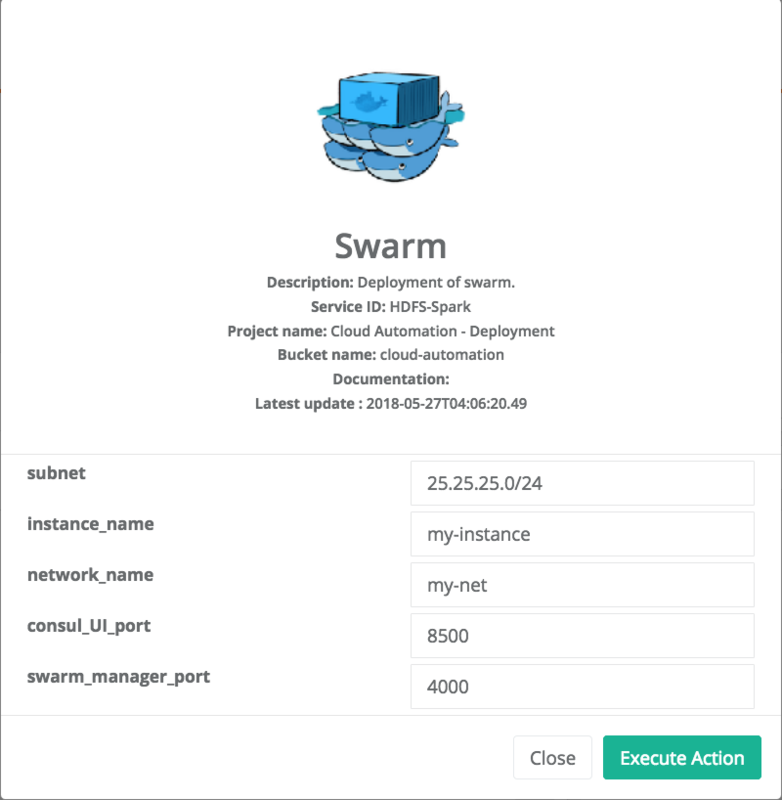 You an release the ressource or deploy swarm to have the network and cluster of docker containers. Choose swarm and click on execute Action to deploy it. At the end, the State of the Service Instance is SWARM_DEPLOYED. Three Actions are available at this step and you can access to the cluster of docker containers through the endpoint (consul_UI). At the end, the State of the Service Instance is HDFS_DEPLOYED. Two Actions are available at this step. 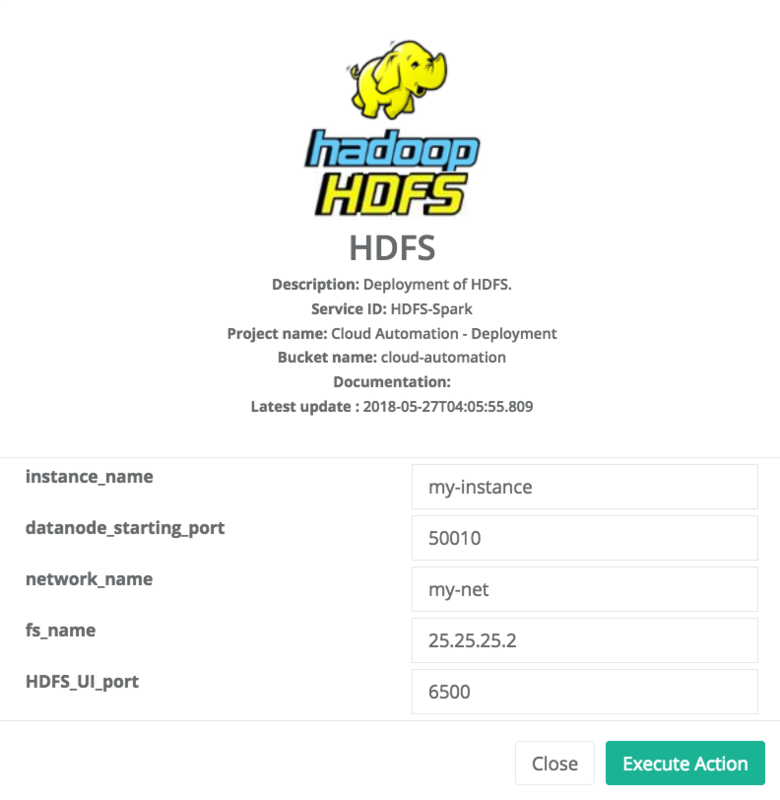 You can access to the HDFS interface or the cluster of docker containers through the endpoints (HDFS_UI, consul_UI). 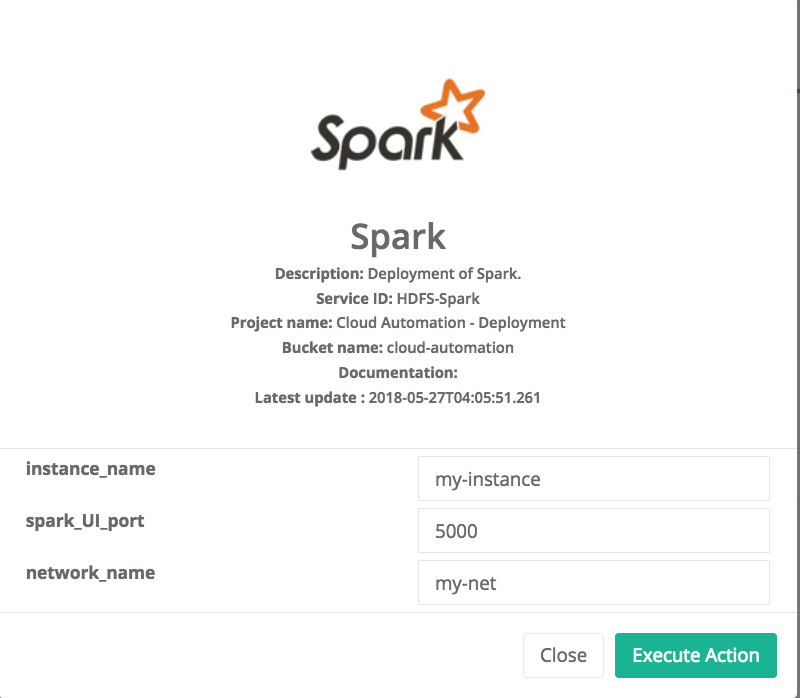 The next step is to deploy Spark. You can access to HDFS or SPARK interfaces (HDFS_UI, SPARK_UI). In this section, we provide a quick reference about how to configure and start some PCA services from our Catalog. This service allows to deploy through ProActive Cloud Automation (PCA) Portal a Cassandra Database server. The service can be started using the following variables. List of the environment variables. Each environment variable should be preceded by -e.
More details about the variable description can be found here. This service allows to deploy through ProActive Cloud Automation (PCA) Portal any docker image. It serves as a generic template that can be used to create and start any docker image ON DEMAND simply by providing the following variables. Docker image name. It can include a tag as well. The main image port. Please note that it will be forwarded to a random port that will be returned by this service. If you desire to stop this container and restart it later. This service allows to deploy through ProActive Cloud Automation (PCA) Portal a Elasticsearch Database server. The service is started using the following variable. This service allows to deploy through ProActive Cloud Automation (PCA) Portal an instance of Apache Kafka publish/subscribe system (https://kafka.apache.org/). The deployed instance consists in a single publish/subscribe broker that is based on Apache Zookeeper coordination server. The service is started using the following variables. Name of the Zookeeper instance that coordinates the storm deployment. Zookeeper service identifier needed to start this service if it does not already exist. This service allows to deploy through ProActive Cloud Automation (PCA) Portal a MySQL Database server. The service can be started using the following variables. Note that the USER and PASSWORD variables are used in junction. They should be either both entered or both blank. In addition, if DATABASE is assigned a value, then the defined USER will be granted superuser access (corresponding to GRANT ALL) to this database. More details about the variable description can be found here. 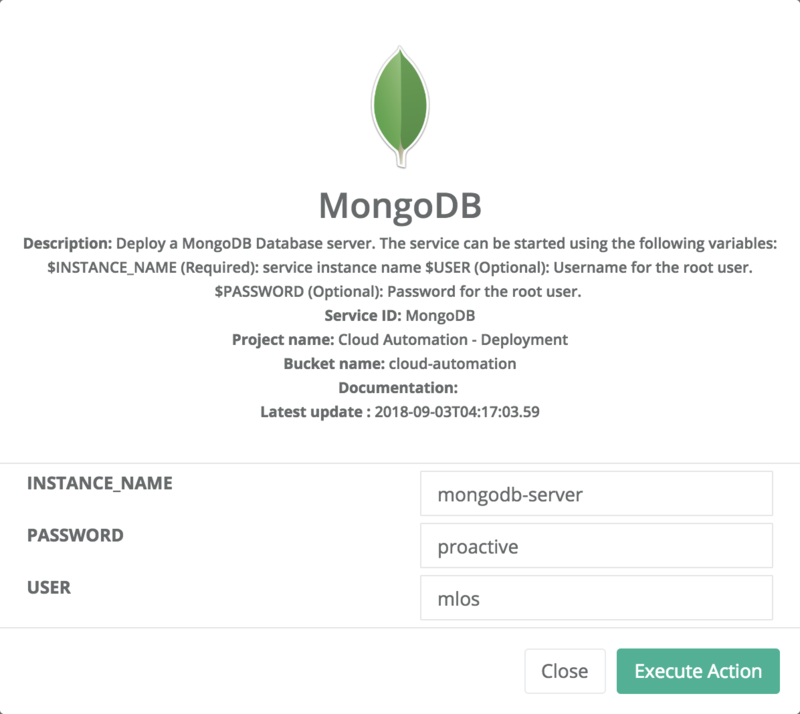 This service allows to deploy through ProActive Cloud Automation (PCA) Portal a MongoDB Database server. The service can be started using the following variables. Note that the USER and PASSWORD variables are used in junction. They should be either both entered or both blank. More details about the variable description can be found here. This service allows to deploy through ProActive Cloud Automation (PCA) Portal a PostgreSQL Database server. The service can be started using the following variables. Username for the root user. change it if you want a different root username . Default "postgres" is used if left empty. This service allows to deploy through ProActive Cloud Automation (PCA) Portal a cluster of Apache Storm stream processing system (http://storm.apache.org). The service is started using the following variables. This service allows to deploy through ProActive Cloud Automation (PCA) Portal an instance of Visdom server (https://github.com/facebookresearch/visdom). The service is started using the following variable. This service allows to deploy through ProActive Cloud Automation (PCA) Portal an instance of Apache Zookeeper coordination server (https://zookeeper.apache.org/). The deployed instance consists in a single Zookeeper broker. The service is started using the following variable.